Give a monkey some darts and balloons at a real zoo; you got a recipe for laughs and a trip to the hospital. In Bloons, you get to experience this combination without the threat of bodily puncturing. A twist on the standard Cannon Fodder formula that everyone has played since the beginning of time, I wonder if the creator was enamored with Gorillas back in the IBM DOS days. 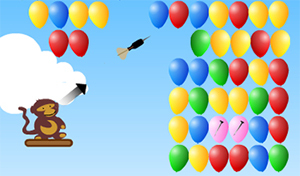 Give the monkey an angle and power, then try to pop all the balloons on the screen. With cool power ups like multi-darts, laser swords, and bombs, it keeps you playing because you know you can beat this level if you just angle it a little more, add a touch more power. It always just takes that little more to satisfy, doesn’t it ladies? 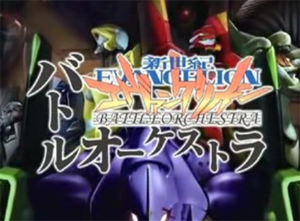 Mix Super Smash Bros. with Evangelion and you end up with 97% of the nerd population creaming their pants. I can safely say that I squirted a bit when I read this. Coming from game maker Broccoli, who is known for churning out Eva games, this one deserves special mention. Featuring what seems to be a slew of Eva’s, Angels, and locations, this game is poised to be a 4 man free for all on the PS2. As you know, MaoChan likes Evangelion, so I am all giddy for this game to be localized here in America. The next best game in the Eva universe since its outing on the Nintendo 64.